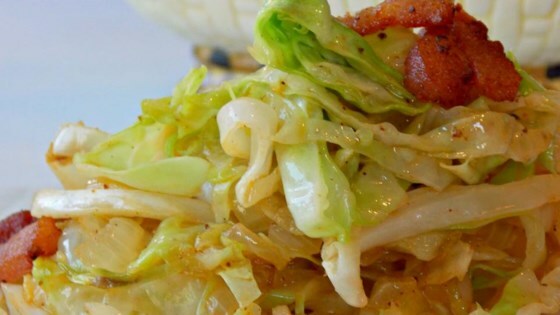 "This is my favorite way to cook cabbage and it's got bacon. What's not to love?" Place the bacon in a large pot or Dutch oven and cook over medium-high heat, turning occasionally, until evenly browned, about 10 minutes. Drain the bacon slices on paper towels and reserve drippings in the pot. Melt butter in bacon drippings in the pot over medium heat. Stir cabbage, onion, salt, pepper, and sugar into butter and bacon drippings. Cover the pot. Cook, stirring occasionally, until cabbage and onion are tender, 15 to 20 minutes. Crumble bacon into cooked cabbage. Followed the receipe & it is GREAT! Takes very little time to make also!! Love this easy side dish with perogies. Will make it again!